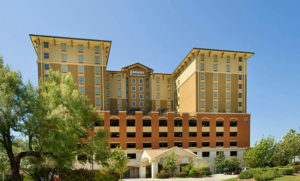 We recently stayed at the Drury Inn in San Antonio Texas. This hotel is modern and looks great from the outside as well as in the lobby. However it is very difficult to get to from the Interstate Hwy., #10 and 1604. It is right on the corner of these two major highways and very difficult to get to as well as to get back on the highway. We made several wrong turns erring to the hotel. We recommend that you park using the garage parking lot. For security reasons you should park inside the gated garage to ensure that your cars contents and car remain safe at night. We paid $90 plus tax for two people. This includes a hot breakfast as well as hot hors d’oeuvres at night and three alcoholic drinks for each person. You can choose between beer, wine and mixed drinks. While generally good value for the money, we did not get a good nights sleep. The king bed that we were provided was very soft, and moved each time the other person in the bed turned over. It was very disconcerting. We’ve had too many situations where the comfort of the bed was not sufficient at this particular hotel chain and will not be staying at this hotel chain even though we will pay more for a single nights accommodation plus food.